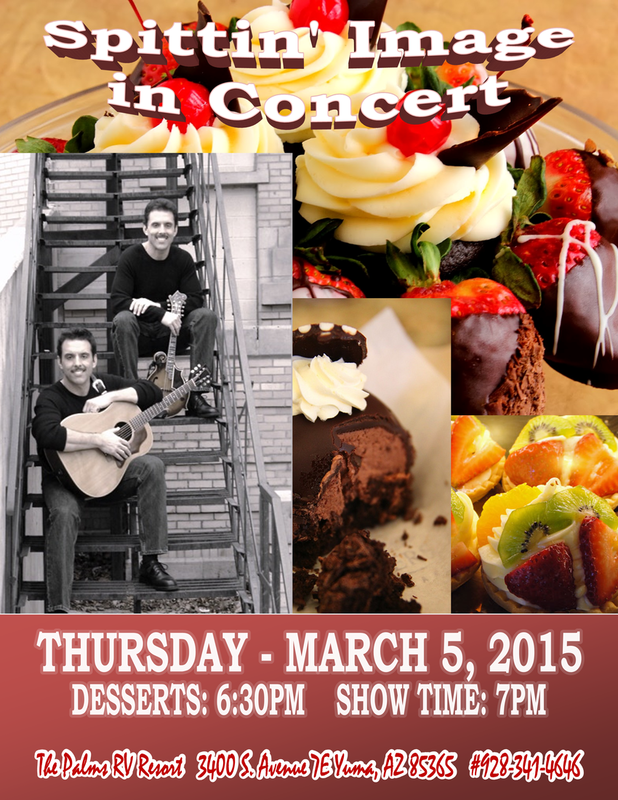 The 2014/2015 Concert Series has yet again ended with great success! We hope you all enjoyed the fun and entertainment we had this season! Please stay tuned for the 2015/2016 Concert Series Line-up to be announced soon! Below is the list of the 2014/2015 Concerts Series past. 2014-2015 Concerts Series Line up Below – Past Concerts. 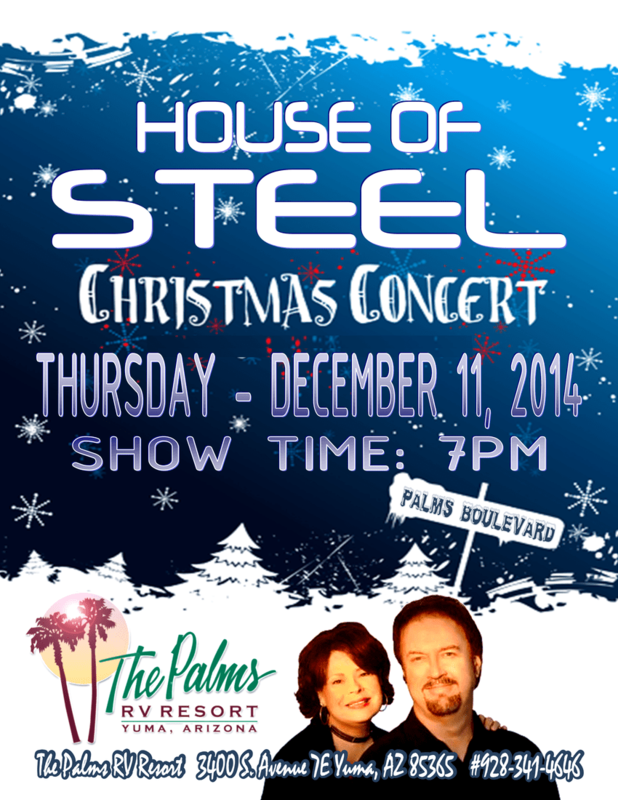 House Of Steel is built around the core members, Mike and Teriney “T” Smith who are both Nashville transplants now based in The Valley Of The Sun. Teriney Smith (“T”) toured the USA, Australia and South America with her original music. T also toured 3-years with Grammy winning artist Larry Gatlin and recorded his “Larry Gatlin & The Texas Flyer Band: LIVE” album as a featured and background vocalist. She has performed in venues such as Farm Aid, Willie Nelson’s July 4th Picnic Bash (50,000 friends and fans), Fort Worth’s Bass Hall with the Fort Worth Symphony and many more. Mike G. Smith has three gold and two platinum albums for his work with The Gatlin Brothers, has recorded 19 of their albums to-date and has also toured the world with The Judd’s, Charlie Rich, Hank Williams, Jr., Jerry Reed and others. He is a 13-time Top Ten Steel Guitarist in Guitar Player Magazine (worldwide) and is the recipient of the NARAS/Grammy “Super Pickers” Award. 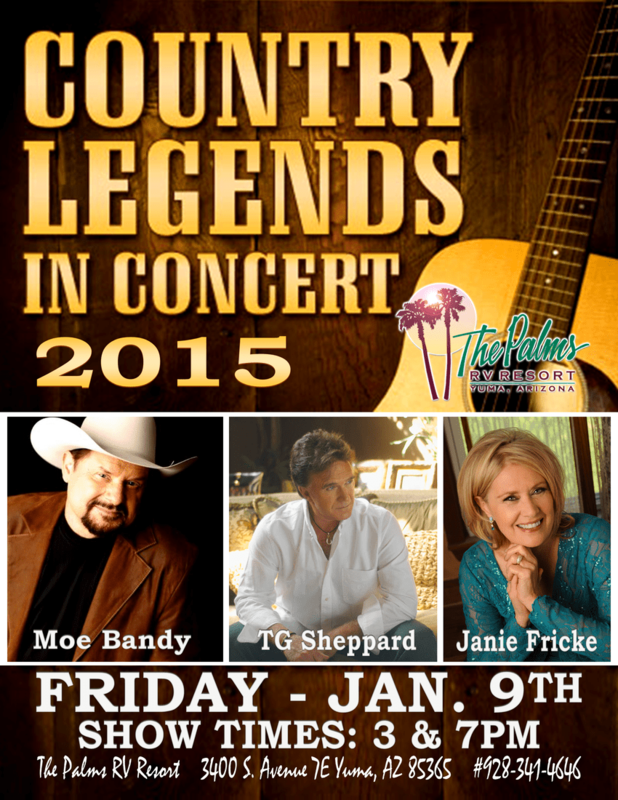 Enjoy a great afternoon of the best of the best in Country Music with Moe Bandy, Janie Fricke, and T.G. Sheppard as they share the music and the memories from careers that have spanned generations. 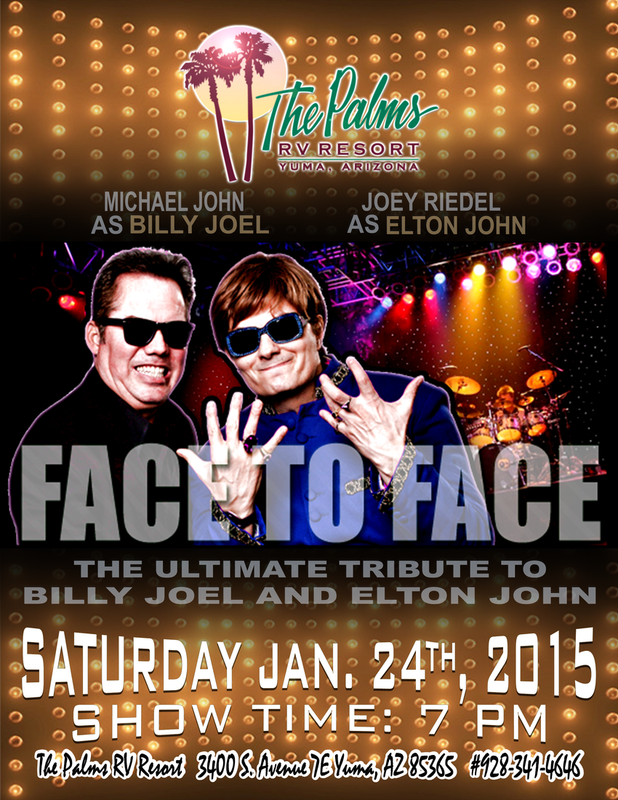 The Ultimate Tribute to Sir Elton John and to Billy Joel: The Face To Face Show. Elton John and Billy Joel tribute artists Joey Riedel and Michael John have joined forces to create The Ultimate Tribute Show. The two capture both artists in their high energy, interactive Rock N Roll show. Joey and Michael bring this experience to The Ultimate Tribute show adding funny performance bits, sing-a-long parts, and spontaneous humor. The Billy Joel Elton John Ultimate Tribute show is a night of hit songs, energetic performances, outrageous costumes, and true Rock N Roll at its finest! Born and raised in Sweden, Annika Starander Weaver, who appears as Faith Hill, comes from a musical family. She started her singing career at a young age performing in clubs, cruise ships and amusement parks. Annika’s path has taken a turn to one that pays tribute to one of her favorite Country artists and creative role models, Faith Hill. 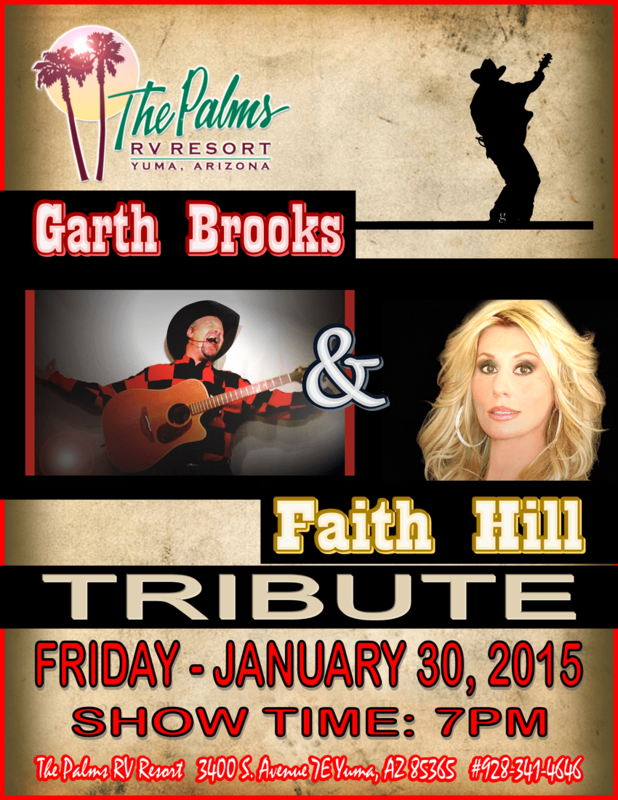 It was when she was called to impersonate Faith Hill in a duet with a Tim McGraw impersonator that she was urged by the show`s producer to continue in the role of Faith Hill full time. TJ Weaver, who appears as Garth Brooks, performed in the EMMY award winning Las Vegas Stampede Concert Series to the theme song Southern boy which he co-wrote and was later broadcasted nationally in over 140 million homes. In 2003 TJ headlined in David Saxe Productions’ “Giddy-up and Tribute” in a sold out 2050 seat showroom at the Tropicana Hotel Casino in Atlantic City. Weaver also headlined the Sahara Hotel Casino on the Vegas Strip in a show called “Buck Wild” where he was the host and lead male vocalist. 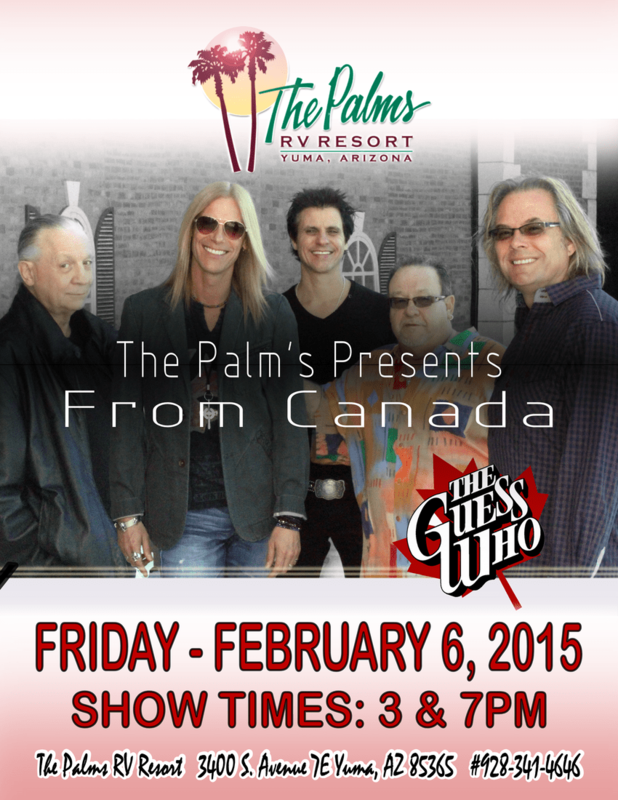 The Guess Who are a Canadian rock band from Winnipeg, Manitoba. Initially gaining recognition in Canada, the group also found international success from the late 1960s through the mid-1970s with numerous hit singles, including “No Time”, “American Woman”, “These Eyes” and “Share the Land”. The band was inducted into The Canadian Music Hall of Fame in 1987. That same year the group was inducted into Canada`s Walk of Fame. In 2003, The Guess Who performed before an estimated audience of 450,000 at the Molson Canadian Rocks for Toronto SARS benefit concert. The show was the largest outdoor ticketed event in Canadian history. Cahal Dunne, “Ireland`s Happy Man”, possesses that certain magical quality known in show business as “it.” “It” transcends talent. “It” comes from deep within a great entertainer and washes over an audience, captivating them. This native of County Cork has a following of loyal admirers and friends that is unique in the rich history of Pittsburgh entertainment, and continues to make new friends with each appearance. 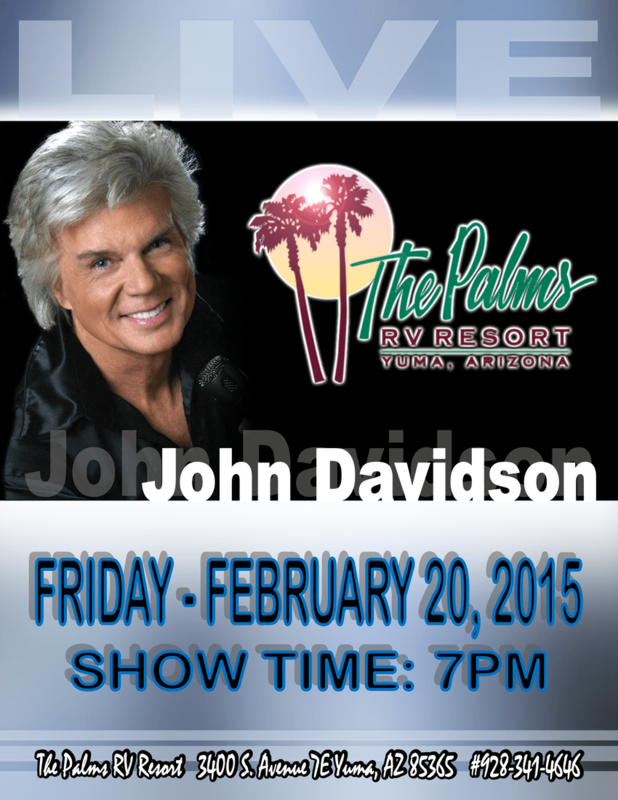 They don`t come any nicer than John Davidson. The dark-haired, Pittsburgh-born singer/TV personality is highly-defined and sometimes cursed by his clean-cut, fresh-faced, apple-cheeked handsomeness. John took his naturally-gifted baritone voice to the musical stage and made his Broadway bow at the Ziegfeld Theater. Music, however, has always been John`s first passion. In addition to recording 12 solo albums in both the pop and country music venues, he plays the guitar and banjo and has sung in English, French and Spanish. A perennial nightclub and concert favorite, he has starred in many national tours and stock productions including “The Music Man”, “Paint Your Wagon”, “Li`l Abner”, “Camelot”, “Carousel”, and “Will Rogers` Follies. He`s appeared in legit plays, including the off-Broadway comedy, “High Infidelity”, opposite both Barbara Eden and Morgan Fairchild, and, in 1996, returned to Broadway, after 32 years, in the Rodgers and Hammerstein musical, “State Fair”. Spittin’ Image are identical twin brothers who love to sing and play their instruments as much as they love to entertain an audience. Intertwining wonderful vocal ability with excellent musicianship, and mixing it all with comedy, audience participation, and a high energy show. 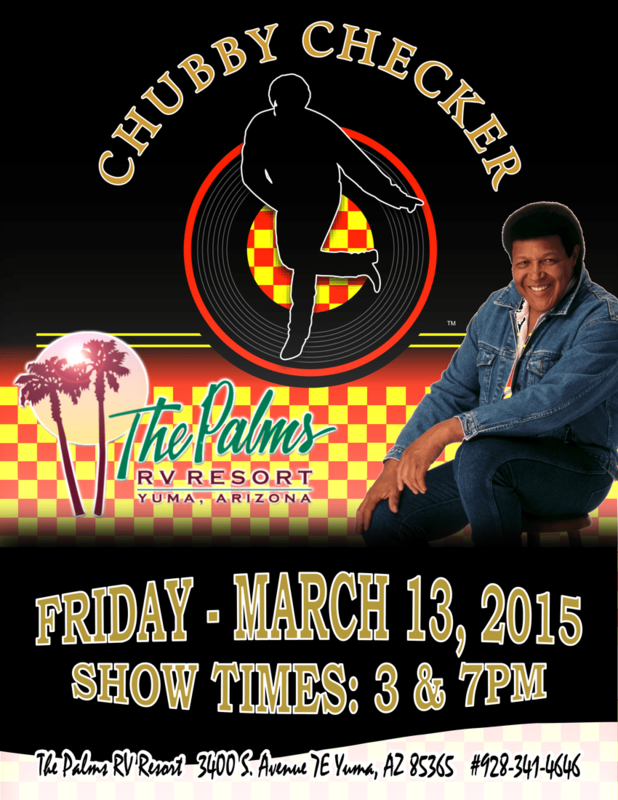 Top 40 and classic country mixed with classic rock and roll is the music they love to perform. But, the twins also enjoy singing gospel and pop standards from the 20’s, 30’s and 40’s. Spittin’ Image are two of the most versatile, fun-loving, enthusiastic performers you’ve ever seen. With extensive and outstanding musical skills and a terrific variety of fine-tuned comedy routines, Spittin’ Image will surprise and delight you. 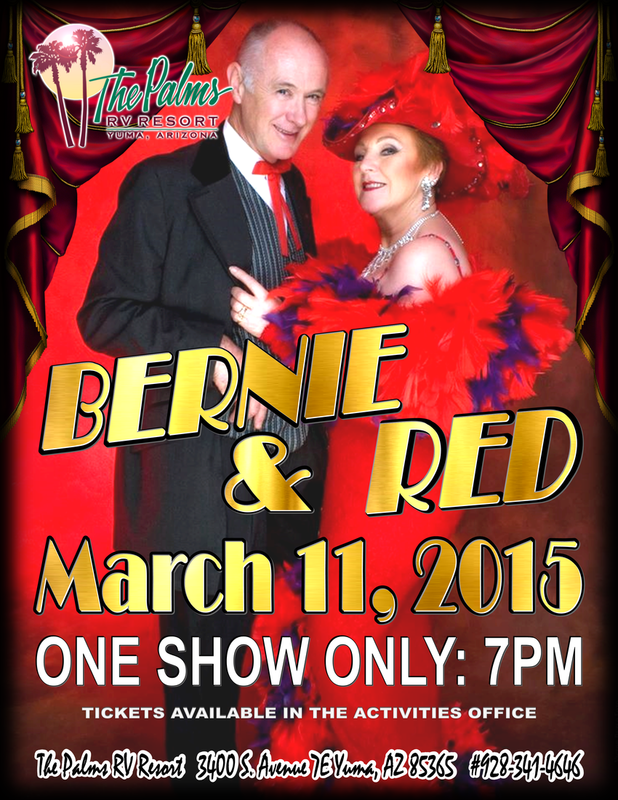 Comedy & Music: If you are looking for good professional entertainment, Bernie & Red are a fresh, original, funny & very entertaining husband & wife team who perform throughout North America. Original & Funny! Everyone needs a point of reference when trying to describe a musical or comedic style, & in the case of Bernie & Red. It has been said that they are a mixture of Burns & Allen, The Smothers Brothers & Bette Midler, with a touch of Carol Burnett and a dash of Benny Hill! Quite a mixture! 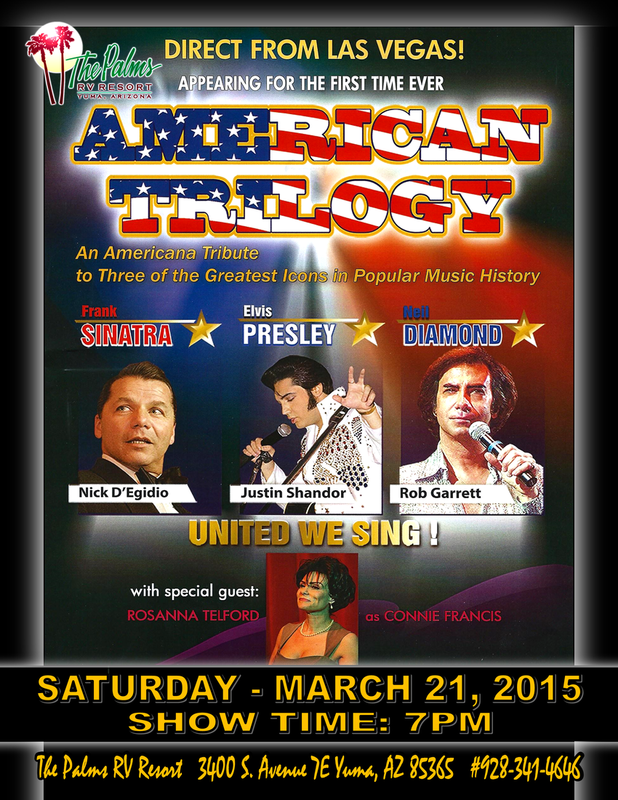 “AMERICAN TRILOGY” is a “tribute” show packed full of energy, excitement & loads of great music, as it commends four legends in popular music history. These four performers have been doing tributes shows for many years and it shows in their spot-on performances. 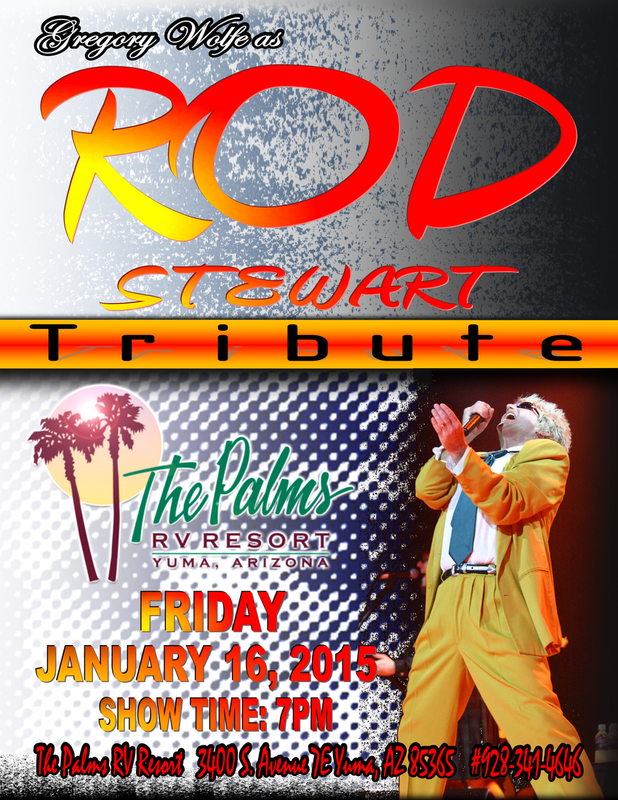 Most tribute shows have look-alike performers but they lip-synch the singing parts. NO lip-synching going on in this show!!! These tribute performers exude true “sound-alike” & “look-alike” qualities that have even fooled their legends best critics, their family, friends and fans! It is 90 minutes of non-stop music and fun, ending with a grand finale. 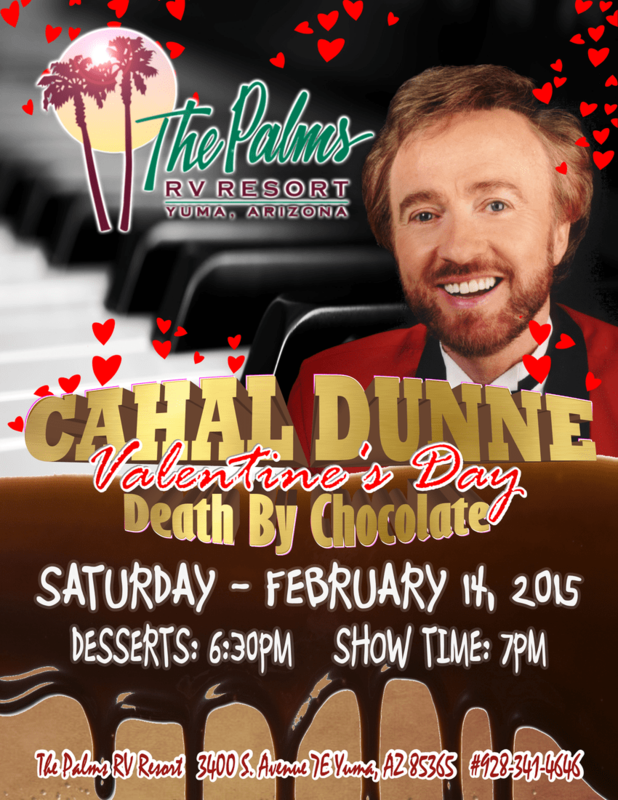 Come take advantage of being able to enjoy the “next best thing” to the real deal, in the most affordable way!